To Have and Have Not (1944) was director Howard Hawks' wartime adventure masterpiece - a minor film classic loosely based upon part of Ernest Hemingway's 1937 novel of the same name. Jules Furthman and William Faulkner partnered their talents to write the screenplay, retaining some of the sharp dialogue from the book. 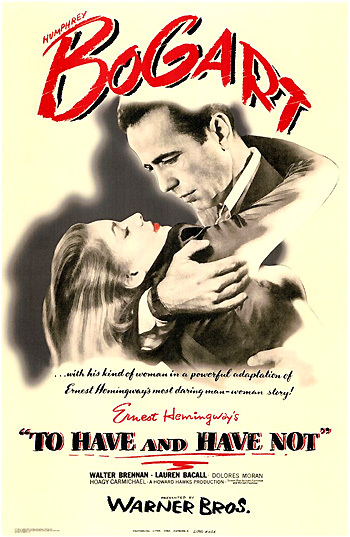 Warner Bros. Studios decided that it needed a sequel in an exotic locale to follow up their earlier success of Casablanca (1942), so they chose this similar vehicle with comparable ingredients: an exotic locale in the Caribbean (WWII Martinique), an unmarried ex-patriate American (a charter-boat captain who is tough, sardonic, and politically apathetic - at first), a romantic love interest to create on-screen electricity, Free French (Gaullist) resistance fighters, a Vichy/Gestapo police captain, a cafe/bar and a piano player. "The ONLY kind of woman for his kind of man." "AT LAST! Bogart makes love to his kind of woman." Their palpable chemistry and electricity is sizzling as their relationship rapidly heats up (on-screen and off-screen), and they affectionately call each other "Slim" and "Steve." [Note: Hawks' and his wife's pet nicknames for each other were Slim and Steve.] The film was also the first time that Bogart worked with Hawks - Bogart and Bacall were further teamed together in Hawks' follow-up film The Big Sleep (1946), a version of Raymond Chandler's first Philip Marlowe novel. The film's action is prefaced by a zoom-in view of a Caribbean map. The locale is the German/Vichy-controlled Caribbean island of "Martinique in the summer of 1940, shortly after the fall of France" during WW II. In the port city of Fort de France, politically-apathetic, cynical fishing boat Captain/privateer Harry Morgan (Humphrey Bogart), owner of the Queen Conch cabin cruiser (licensed in Key West Florida), hires out his boat for professional sports fishing - they go out no "more than thirty miles offshore." His amiable, drunken, dim-witted, quirky buddy that he cares for is Eddie (Walter Brennan), a gimpy-legged "rummy" with the jittery shakes, and a Caribbean helper named Horatio (Sir Lancelot). Johnson: I don't see what you want that rummy around. Morgan: Eddie was a good man on the boat before he got to be a rummy. Johnson: Well, he's no good now...Is he related to you or something? Johnson: What do you look after him for? Morgan: He thinks he's lookin' after me. Was you ever bit by a dead bee?...a honey bee. Johnson replies: "I was never bit by any kind of a bee." After another aborted attempt at hooking a large fish without keeping plenty of drag on the fishing line, Johnson loses the line and reel and falls over backwards - looking ridiculous ("When the fish struck, you couldn't hold 'em"). That's what you owe me and that's what I want. Johnson: I thought everybody took their flag in after six o'clock. Morgan: Most of 'em do. Johnson: That's Vichy for you. The apolitical boat-owner lives in the Marquis Hotel run by Gaullist hotelkeeper Gerard ("Frenchie") (Marcel Dalio), the leader of the Free French. Frenchie approaches the skipper to ask for his help - to use his boat that night to smuggle in "some friends of friends of mine," but a disinterested Morgan staunchly refuses to get involved in the risky venture: "Not a chance...I'd like to oblige you, Frenchie, but I can't afford to get mixed up in your local politics." He tosses her a box of matches so she can light her own cigarette. She aggressively lights the flame, looking at him with her wide expressive eyes. She flings the used match backward out the door, tosses the box of matches back at him, turns and leaves without any emotion: "Thanks." Morgan finishes his conversation with Frenchie about his lack of loyalties: "I know where you stand and what your sympathies are. It's alright for you, but I don't want any part of it. They catch me fooling around with you fellas and my goose will be cooked. Probably lose my boat too. I ain't that interested." In the tropical bar as Morgan has his dinner, he watches the local cafe pianist Cricket (Hoagy Carmichael) and others gathered around the keyboards, including Marie Browning dressed in a grey checkered suit having drinks with Morgan. She stands and accompanies Cricket in "Am I Blue? ", leaning against the piano and glancing over at Morgan at the far table to gauge the effect of her performance. Slim: What do you want? Slim: What are you talking about? Hey mister, what's got into you? (He takes her by the arm into his across-the-corridor room, and locks the door behind him.) What do you think you're gonna do? Steve: I'm gonna get that wallet, Slim. Slim: I'd rather you wouldn't call me Slim. I'm a little too skinny to take it kindly. Steve: Quit the baby talk. Which is it? Slim: He doesn't speak so well of you. Steve: He's still my client. You oughta pick on somebody to steal from that doesn't owe me money. Slim: He dropped it and I picked it up. Steve: And you were gonna give it back to him, of course. Slim: No, no I wasn't. I don't like him. Steve: That's a pretty good reason. Slim: Besides, I need boat fare to get out of Martinique. To his surprised consternation, Morgan finds sixty dollars in cash, and about $1,400 in traveler's checks in Johnson's wallet - more than enough to cover his fishing bill - "'I haven't got that much on me,' he says. 'I'll have to go to the bank and pay you off tomorrow,' he says. And all the time, he's got a reservation on a plane leaving tomorrow morning at daylight." Slim deduces that Johnson was deliberately dishonest and had intended to leave without paying. So now they are allies - she has done him "a favor" by lifting the wallet, but if he hadn't stopped her, she'd "have gotten away with the whole works." In this scene, he offers her a cigarette and lights it for her. Eddie: Say, was you ever bit by a dead bee? Beauclerc: I have no memory of ever being bit by any kind of bee. Eddie: That's right. You and Harry and Frenchie. You know, you got to be careful of dead bees if you're goin' around barefooted, 'cause if you step on them they can sting you just as bad as if they was alive, especially if they was kind of mad when they got killed. I bet I been bit a hundred times that way. Slim: You have? Why don't you bite them back? Eddie: That's what Harry always says. But I ain't got no stinger. Neutral and uncommitted, Morgan refuses to get involved in politics: "I don't care who runs France - or Martinique - or who wants to run it. You'll have to get somebody else." Slim and Morgan continue with their "unfinished business" downstairs - he suggests that Slim return the wallet to Johnson. They approach Morgan's "client" to confront him with the evidence of his duplicity, and ask him to "count those traveler's checks," knowing that the plane ticket is for 6:30 in the morning, "and the bank opens at ten." In the continual dance of cigarettes and match-lighting between Slim and Morgan, Slim strikes a match during the heated discussion and lights his cigarette for him. While Morgan forces Johnson to begin signing over the checks, the resistance leaders who are leaving the bar's cafe are ambushed by a Vichy police raid. Bullets fly in all directions from machine guns, and Johnson is killed - he is one of the casualties from a stray bullet. As Morgan looks at the unsigned checks, he remarks that the dishonorable man received his just reward: "He couldn't write any faster than he could duck. Another minute and these checks would have been good." Harry and Slim are among those chosen to be questioned by the head of Gestapo police - a rotund, beret-wearing, surly Captain Renard (Dan Seymour). Harry's funds owed to him from Johnson's wallet are impounded by the police, but he is promised: "If your claim is just, it will be discharged...as for the money, if it is yours, that will arrange itself in good time." During her interrogation by the Vichy-Gestapo, Marie Browning's (an "American, aged twenty-two") shady past is slightly illuminated. She arrived at Martinique earlier by plane that afternoon, stopping en route from Trinidad (Port of Spain) to the United States. Before that, she was in Rio in Brazil - alone. The stranded pickpocket had stopped in Trinidad to "buy a new hat." Because her tone appears "objectionable" to one of the officials during the interrogation, she is slapped across the face with her own passport, but reacts stoically. She explains how she ended her trip in Martinique because she was broke: "Because I didn't have money enough to go any further." In answer to the question about his "sympathies," Morgan retorts that he is a non-interventionist: "Minding my own business...I don't need any advice about continuing to do it, either." After they are released from their mistreatment by the authoritarian provisional governmental officials, they both find themselves thirsty but broke at a bar: "No money, those guys cleaned me out." Slyly and alluringly, Slim suggests: "Maybe I can do something. It's been a long day and I'm thirsty," promising to rendezvous with Morgan afterwards. In her accustomed role as a slinky pickpocket, she selects a French officer as her prey in the barroom (by asking for a cigarette light for the cigarette that she had just borrowed from Harry) and begins dancing with him. Slim: You're sore, aren't ya? Steve: Why should I be? Slim: I didn't behave very well, did I? Steve: You did all right. You got the bottle, didn't you? Slim: I know, I know. You don't give a 'whoop' what I do, but when I do it, you get sore. After all, you told me to, you know. Slim: You said 'go ahead,' didn't ya? Steve: Oh yeah, that's right, I-I guess I did. You were pretty good at it too. Slim: Thanks! Would you rather I wouldn't? Slim: Do things like that. Slim: I'd like to know. Slim: All right, all right, I won't do it anymore. Steve: How long have you been away from home? Slim: This is about the time for it, isn't it? Steve: The time for what? Slim: The story of my life. How do you want me to begin? Steve: I've got a pretty fair idea already. Steve: You did. That slap in the face you took. Slim: Yeah, what about it? Steve: You hardly blinked an eye. It takes a lot of practice to be able to do that. Yeah, I know a lot about you, Slim. Steve: Hey, you forgot your drink. Slim: I don't want it. Steve: You forgot your bottle. Slim: I said I didn't want it. Slim: Look, I'm tired and I want to get some sleep. Steve: That's not a bad idea. What made you so mad? Slim: I've been mad ever since I met you. Slim: One look and you made up your mind just what you wanted to think about me. You were... Oh, what's the use? Steve: Go ahead, keep on going. Slim: You don't know me, Steve. It doesn't work. I-I brought that bottle up here to make you feel cheap. (Her tough facade cracks.) That didn't work either. Instead, I'm the one who feels cheap now. I've never felt that way before. I want...I thought that maybe...Go on, get out of here, will you, before I make a complete fool of myself. Steve: How long have you been away from home, Slim? Slim: It's none of...about six months. Steve: What are ya gonna do here? Slim: I don't know. Get a job maybe. Slim: Remind you of somebody, Steve? Steve: It's brand new to me. I like it. Would you go back if you could? Slim: I'd walk if it wasn't for that water.